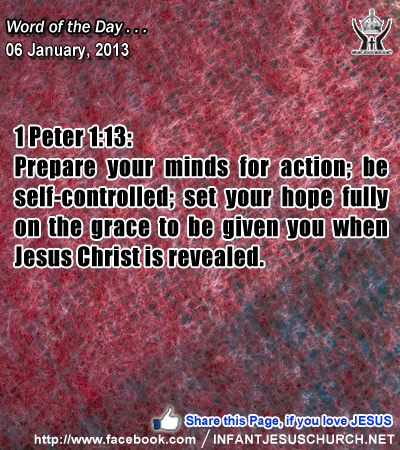 1 Peter 1:13: Prepare your minds for action; be self-controlled; set your hope fully on the grace to be given you when Jesus Christ is revealed. Heavenly Father, we long for the day when we get to see Jesus face to face coming with the angels in power. Until that time, fasten our heart in hope to the glory Jesus will share with me on that day, and please allow us to live as one who knows that victory is mine in Jesus. Jesus, through your powerful name we pray. Amen. 1Now when Jesus was born in Bethlehem of Judea in the days of Herod the king, behold, wise men from the East came to Jerusalem, saying, 2 "Where is he who has been born king of the Jews? For we have seen his star in the East, and have come to worship him." 3When Herod the king heard this, he was troubled, and all Jerusalem with him; 4and assembling all the chief priests and scribes of the people, he inquired of them where the Christ was to be born. 5They told him, "In Bethlehem of Judea; for so it is written by the prophet: 6And you, O Bethlehem, in the land of Judah, are by no means least among the rulers of Judah; for from you shall come a ruler who will govern my people Israel." 7Then Herod summoned the wise men secretly and ascertained from them what time the star appeared; 8 and he sent them to Bethlehem, saying, "Go and search diligently for the child, and when you have found him bring me word, that I too may come and worship him." 9When they had heard the king they went their way; and lo, the star which they had seen in the East went before them, till it came to rest over the place where the child was. 10When they saw the star, they rejoiced exceedingly with great joy; 11and going into the house they saw the child with Mary his mother, and they fell down and worshiped him. Then, opening their treasures, they offered him gifts, gold and frankincense and myrrh. 12And being warned in a dream not to return to Herod, they departed to their own country by another way. The Lord of the universe who exposed the star of Bethlehem to the Gentiles of the East so they could come and worship Jesus, the Prince of Peace (Infant Jesus) and King of Kings, gives each one of us the same light of exposure to recognize and accept Jesus as our Lord and Savior. Faith is an completely free gift that God makes to us. It is through the help of the Holy Spirit, who moves the heart and opens the eyes of the mind that we are able to understand, accept, and believe the truth which God has exposed to us through his Son, Jesus. In faith, the human motivation and intellect cooperate with grace. To know God personally is to encounter and know Jesus. In the encounter of the wise men with Jesus we see the preparation of God to give his only Son since King and Savior, not just for the Jewish people but for all the nations as well. The Lord Jesus came that together Jew and Gentile might find true and lasting peace with God. Let us pray today that Jew and Gentile alike will discover the Lord and Savior on their journey of life. Do we bring the light of Jesus to those you meet through the witness of your life and testimony? Loving Infant Jesus, we thank you for bringing deliverance to all the nations. May the gospel of deliverance be proclaimed to every nation today and to every person on the face of the earth. Help us to be a good witness of the joy of the gospel to all I meet.